Sweetgreen, the local salad restaurant chain started in D.C. by Georgetown business school graduates, has become one of my favorite places for weekday lunch. I was lucky enough to visit their K Street location on opening day (and, as one of the store's first customers, got to enjoy a free salad). If you've eaten at Chipotle or other similar fast-casual restaurants, the drill will be familiar: line up at the counter, decide if you want a salad or wrap, select an ingredients combination from the menu or make up your own, choose a drink, pay, eat, leave. It's pretty simple. The salads I've had at Sweetgreen have been quite good. I'm particularly fond of the rotating monthly salad special. 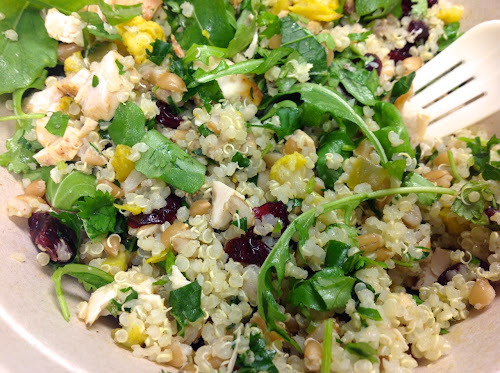 The December salad (pictured above), which debuted this week, features arugula with warm quinoa, chicken, curry-roasted cauliflower, dried cranberries, chopped cilantro, and dressing. I'm very pleased with it, but I'll miss the November salad, which had oven-dried kale chips, cauliflower, sweet potatoes, turkey and cranberry dressing. If you think Sweetgreen is just another Chop't, you're wrong. It's way better. The quality of ingredients is definitely superior and the portion size is just right. What really sets Sweetgreen apart is its friendly service. I don't know if all the locations are like this, but the people at the CityVista K Street location are always super friendly and engaging. They don't make you feel like cattle, even when they're quickly moving a line through. The chain is expanding quickly: Its website lists 15 locations now, mostly in D.C. and the surrounding suburbs with a couple locations in Pennsylvania. Sweetgreen. 1065 5th Street NW (Between K and L streets), Washington, D.C. (Mount Vernon Triangle) and other area locations. 202-289-4674. I need to give this place a try. A coworker of mine used to insist Sweetgreen is better than Chop't and now you rave about it. I love the idea of a Chipotle-style salad joint, but Chop't always left me feeling disappointed. No matter what I ordered there, it always tasted the same. This place sounds much better. I think you'd really like it. The ingredients seem to rotate based on what's in season.